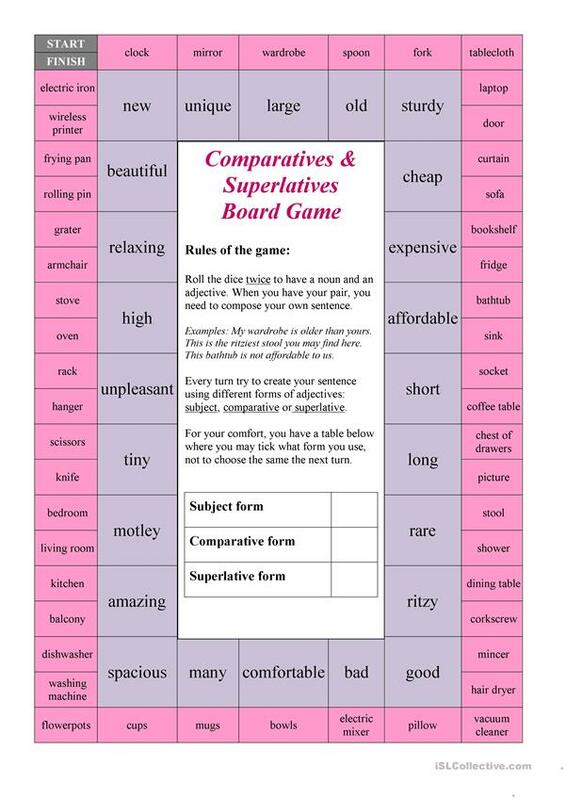 Hello, it's my new Board Game dedicted to comparative and superlative forms practice. All the rules can be found inside of the game. The key topic of the game - things at home: rooms, tools, tableware, etc. The adjectives are not of simpliest character, thus your students will definetly learn something new. Because of the structure you may have about 1000 of different possible combinations. Your comments and likes are always warmly welcome. The above downloadable printable is meant for high school students, elementary school students and adults at Elementary (A1), Pre-intermediate (A2), Intermediate (B1) and Upper-intermediate (B2) level. It is a useful material for revising Comparison (comparative and superlative) in English, and can be used for enhancing your groups' Listening and Speaking skills. It is focused on the theme of Home.